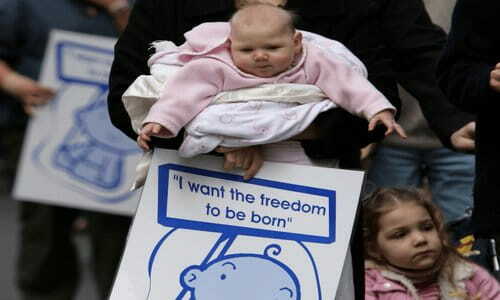 Wild cheering and applause erupted in the New York State legislature as lawmakers voted on Tuesday to declare abortion until birth a "fundamental right" and strike any protections for children in the womb from the books. January 22 was chosen to celebrate the anniversary of Roe v. Wade, which has resulted in the destruction of more than sixty million pre-born children since 1973. The state Senate voted 38-24 in favor of the "Reproductive Health Act," with the Assembly passing it by a margin of 92 to 47. The legislation states in part that "Every individual who becomes pregnant has the fundamental right to choose to carry the pregnancy to term, to give birth to a child, or to have an abortion." New York State has some of the highest abortion rates in the country, and more black babies are aborted each year than are born. Abortion was previously legal until 24 weeks, but has now been removed from New York's penal code. For New York's abortion radicals, there is no such thing as too much feticide. The ghoulish cheering that hailed the passage of a bill that permits nearly full-term infants to be injected with poison and murdered was not the only grave-dancing that took place. Governor Andrew Cuomo also directed the One World Trade Center to light up their 408-foot spire in pink, and ordered that the Governor Mario M. Cuomo Bridge, the Kosciuszko Bridge, and the Alfred E. Smith Building in Albany be lit up as well to celebrate the new right of New Yorker's to have viable babies in the womb dismembered and poisoned to death. The bill, said Cuomo, was "a historic victory for New Yorkers and our progressive values...I am directing that New York's landmarks be lit in pink to celebrate this achievement and shine a bright light forward for the rest of the nation to follow." Pink or blue? was my first thought when I saw Cuomo's directive. He chose pink to celebrate the extension of abortion to after viability, but it seems as if New York's landmarks are lit up to commemorate the passing of untold nameless ones. This is what Cuomo and America's progressives call a "bright light forward"--a land where de facto infanticide is lustily practiced to the wild cheers of politicians running for office on promises to defend the little guy. There is no other word to describe it: This is evil, and there can be no parley with the people who joyously trample on the children in the name of their freedom.